Age-related macular degeneration (AMD) is a disease in which the macula (the central part of the retina) begins to degenerate, resulting in distortion or loss of central vision. It typically occurs in older populations, hence the name. According to the American Academy of Ophthalmology, there are two types of AMD—dry AMD and wet AMD. Dry AMD is the most common, affecting about 80 percent of those suffering from this disease. It occurs when parts of the macula become thin and tiny pieces of protein grow (called drusen). Wet AMD is identified by the growth of new, abnormal blood vessels under the retina. These vessels will leak fluids (blood or others) which leads to macular scarring. This type of AMD causes vision loss faster than dry AMD. Unfortunately, there is no cure for AMD at this time, but it may be preventable, and if you already have it, there may be a way to slow the symptoms. Your nutrition can play a huge role in preventing this disease. Certain micronutrients have been shown to play a significant role in preventing or contributing to AMD. In a study published in the August 2001 issue of Archives of Ophthalmology, researchers found that certain fats found mostly in junk foods contributed to AMD. This study showed that eating these junk foods may increase your risk of AMD. Another study found in Investigative Ophthalmology & Visual Science reveals foods that are higher on the glycemic index, like refined carbohydrates, are associated with a higher risk of AMD. Many studies have shown the significant impact of these foods on the development or worsening of AMD later in life. Not only do you need to avoid these foods, you also need to be proactive in consuming certain foods to prevent or slow the development of AMD. While certain fats are important to avoid, omega-3 fatty acids were found to play a protective role against AMD. Docosahexaenoic acid (DHA) and eicosapentaenoic acid (EPA) are two omega-3s that were found in a 2014 study to have a preventive role against AMD. This study tested the blood serum levels revealing a significant association between DHA and EPA consumption with a lowered risk for AMD. Omega-3s are found largely in fish, flaxseeds (ground for easy absorption in the body), chia seeds and walnuts. Certain carotenoids that are already found in the retina are beneficial when consumed to aid the eye’s function. Lutein and zeaxanthin have antioxidant properties which help to fight against free radicals in the eye. They do this by improving pigment density in the macula which absorbs excess blue and UV light, thereby neutralizing the free radicals. 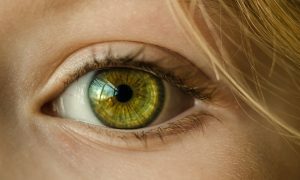 Unfortunately, even though these specific nutrients can be found in many fruits and vegetables, we hardly get sufficient amount of these nutrients for our eyes. Zinc and vitamins A, C, and E are important as well. Zinc can be found in red meat and shellfish, while vitamins A, C, and E may be found in a variety of plant-based foods including fruits, vegetables, seeds and nuts. Listed below is an easy reference for what foods contain specific nutrients. Remember that when buying these foods, they should be high-quality, organic versions for optimum nutrition. Avoiding or consuming certain foods is not the only way to prevent macular degeneration. Smoking is one of the largest contributors to AMD. According to the British Medical Journal, smokers are four times more likely than non-smokers to develop macular degeneration. Another study found that even if you have quit smoking, you are still more likely to develop AMD than those who have never smoked. What’s the bottom line? Don’t smoke, and if you do, quit now to reduce the risk. You may make it a goal to consume as many micronutrients as possible in order to reach your daily recommendation, but if you stay within your recommended calorie allotment, it is close to impossible to reach your daily micronutrient needs. You have to take some form of supplementation, but again, make sure it is high-quality or you will be wasting your money. This seems to be the response for preventing many diseases, and it is no different for AMD. The British Journal of Ophthalmology found that those who exercise regularly are at a reduced risk for AMD by up to 70 percent! In this study, leading an “active lifestyle” was defined as having walked at least two miles per day at least three times per week. Some studies have found that maintaining a healthy cholesterol level can protect against macular degeneration. Without cholesterol blocking your arteries, your eyes will be able to receive appropriate blood flow for maintaining eye health. The Framingham Heart and Eye Studies and Beaver Dam Eye Study, two large health studies, found a significant correlation between high blood pressure and severe forms of macular degeneration. Proper nutrition can help lower or prevent high blood pressure. Remember how we mentioned that lutein and zeaxanthin help the eye to absorb UV and high energy visible (blue) light? Wearing sunglasses can help keep those lights from entering your eyes in the first place. These sunglasses need to state that they protect from these lights or you may be spending money on sunglasses that will not help your eyes. It has not been specifically shown that UV and blue lights will directly cause AMD, but one study found that the combination of overexposure and low antioxidant intake led to a higher risk of developing AMD. Regular eye exams will be one of the best ways to catch macular degeneration in its early stage. The current recommendation by the American Academy of Ophthalmology is that you get a baseline comprehensive examination at 40. Those with risk factors for eye diseases, including AMD, should see an ophthalmologist before age 40. After this baseline is established, the doctor will recommend a regular schedule for exams. As you can see, even with a family history of AMD, it can be slowed or prevented through proper nutrition and taking care of your eyes. Just like with many other areas of health, prevention is key. Nutrition typically plays a major role in prevention, so be intentional about what you eat! This is important for your overall health and quality of life! When is the last time you had your eyesight tested? Do you experience extra sensitivity to glare? Blurry areas on a printed page? Black spots in your vision? Please share with your friends this article on Macular Degeneration so they will learn what food is good or bad for the eyes – Use any of the social media and email buttons on the left of our website. I noticed peanut butter is listed under foods to avoid AND foods to consume. Also, nuts are listed to avoid and , but specific nuts (walnuts, almonds) are listed as OK. This is confusing and contradicting. Maybe further clarification is in order?